Join DISC Corporate Trainer Godwin Anthony at this one day interactive training session and discover how to unlock the secrets behind personality and behaviour traits. This informative and interactive session will provide you with the tools using DISC profiling to transform your relationships and improve communication skills with work colleagues, peers, friends and family… in fact perfect for any situation. 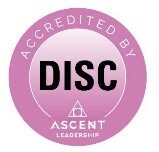 DISC is a powerful tool that will help you succeed and get the most out of every situation.